Honda's dominance has been consistently rising in the Indian automobile industry and its new products are getting quite a good response in every segment. 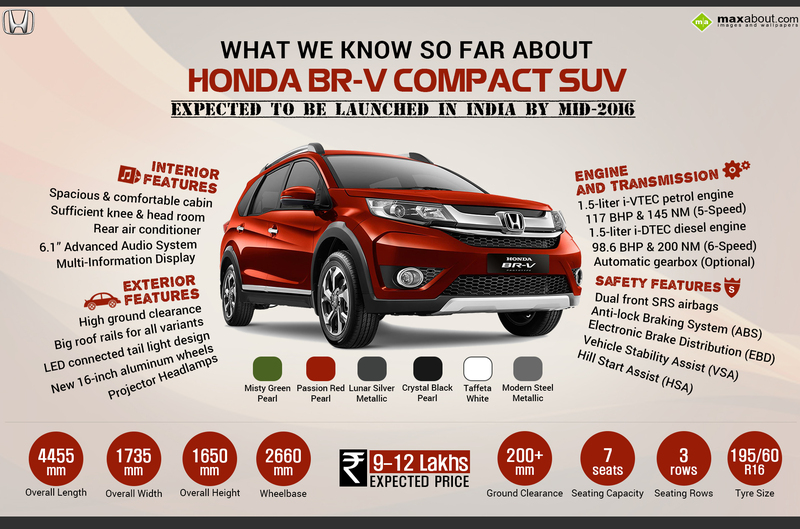 The practicality and quality of their products is admirable and the latest addition to their upcoming list is the Honda BR-V. Based on the Brio platform, the car is again a family pack. Being 7-seater, the car comes with refreshed and aggressive styling, making family travels more exciting than ever. The car gets the signature Honda grill in the front center, dipped in chrome and more massive than ever before. Honda Jazz based front headlights and its high crossover stance makes it more appealing than the current 7 seater, Mobilio. Circular fog lamps get chrome surroundings with a muscular bumper and silver skid plate for the further decoration. Slim black cladding can be seen running throughout its body, with a minor hump near the wheel arches. Rear gets the same chrome treatment and tail lights look pretty good on its body design. The cabin looks neat with the all Black treatment being given to the seats, dashboard and the side panels. This increases the sport appeal of the vehicle and matches its outside styling. The seats look spacious and the 2-3-2 division seems perfect on the design. The steering wheel and the vents gets silver inserts for more precision in designing, making the cabin look classy and cool. The 3-pod instrument cluster houses all the required elements, with its touchscreen infotainment system handling the remaining details. The climate control is expected with the same touch button design. The same set of Honda engines would be provided to the BR-V in India. The first being the iconic 1.5 L petrol motor producing 117 BHP and 145 NM of torque, mated to a five speed manual/automatic gearbox. The other one would be the 1.5 L earth dreams motor producing 98.6 BHP and 200 NM of torque. It would most probably get the 6-speed manual transmission. The Honda engines are refined and mileage efficient, making the car more India friendly. It gets 2nd row air conditioner for better air flow throughout the car, making it a more comfortable option for riding with family. Its cabin is spacious, it gets automatic climate control and the 200+ mm of clearance provides peace of mind even when riding over rugged terrain. It gets a full touchscreen infotainment system with the best connectivity and features like Bluetooth, AUX and USB. The car gets a feature loaded steering wheel for ease of use while driving. BR-V gets dual front SRS airbags, ABS, EBD, Vehicle Stability Assist and Hill Start Assist as its safety features. The crossover gets 195/60-R16 tyres for better on-road grip and stability while riding on high speeds. It gets projector headlamps for better illumination in low light conditions. The shades for the BR-V are Misty Green Pearl, Passion Red Pearl, Lunar Silver Metallic, Crystal Black Pearl, Taffeta White and Modern Steel Metallic. The variants would be disclosed at its time of launch in the 2016. The expected price for the new comer is INR 9-12 lakh, depending upon the engine option and variant being chosen. It would definitely provide real life practicality with a touch of style to it.